To all the dogs I’ve loved before… Holly. As Sam got older and became blind, we took in Holly. 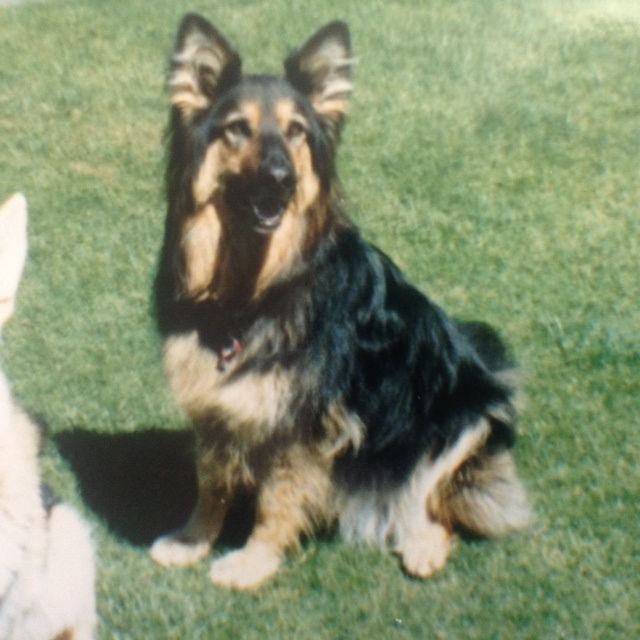 Holly was a long haired, German Shepherd and came from a family who were going overseas. Holly was smart, smarter than was reasonable for a pet. She was in many ways completely wasted being a companion animal and would have excelled as a working dog. She was one of those dogs who you didn’t have to teach anything, she picked things up without being taught. Most dogs know the word “walk”, but for Holly, she knew where the destination of the walk was going to be to – the “bank”, the “park” or just a walk. She learnt all the alternate words for “walk”, “stroll”, “around the block” etc She knew the difference between a “ride” in the car where she wouldn’t get out, to going to the “beach” or the “river”. It got so insane with the number of words she knew, and her listening in on every conversation, that we started spelling words. But she soon learnt those too. We tested whether it was any word that we spelled out but oh no, she knew the difference. We used to joke that for goodness sake, don’t write it down or she would learn to read! At the time we got Holly, we were teenagers, and our group of friends came to adore Holly as much as we did. She’d always tag along to places we went or join in the things we were doing. A popular past time was to go to the local school, someone would hold Holly and everyone would go and hide. When let go, she’d tear off to hunt down myself and my brother, followed by whichever friends we were with. We’d play for hours and she never got fed up with searching for us. Even as big kids, if we played on the playground equipment, such as the slide or the roundabout, she’d come on too. As we got into our later teens and started going to BBQs and gatherings, she’d often tag along sticking to me like a shadow, watching me and making sure I was ok. I had no doubt in my mind that if I got into any trouble, she would protect me. She was also a dog with a sense of humour, if you were sitting on the couch, she jump up next to you, weasle her nuzzle in behind you and nip you on the bum. Of course you’d jump up because you’d been nipped, and she’d be then sitting in your spot wagging her tail and looking amused. In retaliation, I would sit on the couch and pretend I couldn’t see her, loudly exclaim “where is Holly?” and lean on her and fidget like crazy until she move. She always loved these types of boisterous games. She was completely nuts about water in any shape or form – buckets of water, swimming pools, rivers, beaches, super soakers. If there was water involved, she was your dog. Water fights were her absolute favourite thing ever and she’d go insane with excitement. If we weren’t around to play with water, she’d take her ball and drop it into the bucket of water we had for other pets, wait for it to sink then plunge her head into retrieve it – shake and repeat. Holly was also a talker, a friend recently reminded me that if you said “I love you”, she’d voice what sounded like “I love you” back. She’d also argue, if you told her off, she’d grumble and mutter back to you. I remember teasing her about “giving Holly a bath“, we never needed to give her one, but she knew a bath was something she shouldn’t like. So she’d mutter and grumble and bound away while we pretended to try to catch her to give her the imaginary bath. Holly in her later years, unfortunately had a stroke and had to be put down. 15+ years on, I still think of her daily. We often talk about her and the fun we had with her. 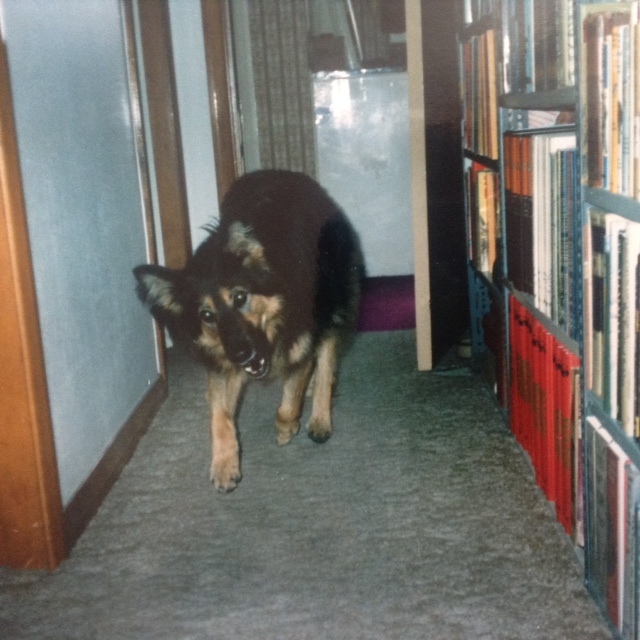 I’ve even had friends who have reminisced about her – she was a special dog. When you get to know and love such an incredible animal, its beyond comprehension how people could ever have given her up. If you enjoyed this, you may also like to read about Hugo and Ruby.